It is held that the signing of the Declaration of Independence was toasted with Madeira but this has yet to be established as fact. Madeira was certainly purchased and drunk by the signers of the Declaration so it is reasonable to believe it filled their glasses. There were other popular drinks at the time including beer, cider, punch, wine, and port so any one of these could have been poured. In this post I take a look at the beverages drunk at various celebrations as reported in the newspapers. Reports of these events make clear that a tradition developed of celebrating with thirteen toasts answered by cannon or gun fire. Despite numerous accounts describing the profusion of toasts there is very little describing what was toasted with. It appears that a traditional drink did not develop simultaneously. Continental Congress, July 4, 1776, Printed Declaration of Independence. George Washington Papers at the Library of Congress, 1741-1799: Series 4. General Correspondence. 1697-1799. The Independence Day celebration in Philadelphia on July 4, 1777, was initiated by the discharge of thirteen cannon from ships and galleys. The members of Congress, officers, and foreign dignitaries were all in attendance. After dinner, toasts were drunk, each one accompanied by “triple discharges” of cannon, small arms, and huzzas. The evening concluded with the ringing of bells and a fireworks show that concluded with thirteen rockets. Two years later Colonel Nichol’s regiment discharged thirteen volleys to introduce the toasts at the July 4, 1779, celebration. These thirteen toasts began with, “The United States of America by the grace of God FREE and INDEPENDENT.” There must have been much cheerful drinking for the account notes that the “whole was conducted with great order and decorum; no unfortunate accident happened”. Unfortunately for us, we again do not learn what they drank. 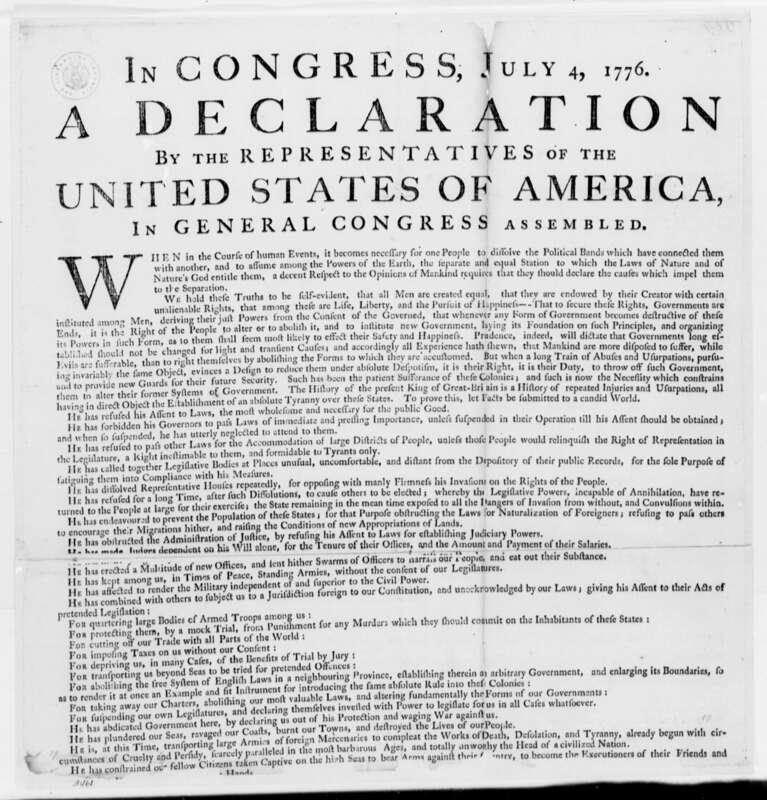 The Manner in Which the American Colonies Declared Themselves Independent of the King of England, Throughout the Different Provinces, on July 4, 1776. Copyprint of etching. Prints and Photographs Division. The Library of Congress. After the procession ended Captain Claypool’s corps of light infantry provided a feu de joie, followed by three rounds discharged by the battalion, and three huzzas. The guests then went to dine where they were served only American porter, beer, and cider. No imported liquors were provided. It is with these American drinks that they performed their toasts. Each of the ten toasts was introduced by a trumpet that was answered by ten discharges of artillery and the toast itself was answered by a discharge from the moored ship Rising Sun. A look at celebrations upon news of peace in the Revolutionary War yields a few more clues. 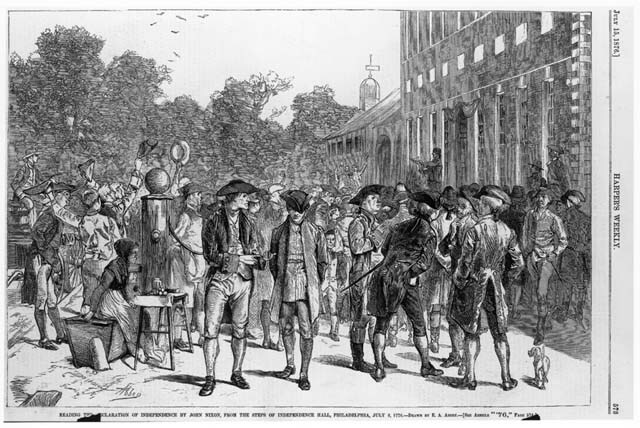 In Marblehead during 1783, the attendees drank from a large vessel filled with liquor that was “duly replenished throughout the day.” It was down in Maryland at the Official State Celebration for Peace and Independence that we find Madeira being served. The celebration was held on April 23, 1783, and was hosted by Charles Carroll at his family house in Annapolis, Maryland. General George Washington, Commander in Chief of the Army was a guest. After dinner there were thirteen toasts answered by the discharge of thirteen cannon. The state house was illuminated at night where an “elegant entertainment” took place. We fortunately know what was drunk because the bill for the dinner and the ball survived. At dinner the waiters served 49 gallons of Claret, 35 gallons of Port, 32 gallons of Madeira, and 6 gallons of spirits. This was followed at the ball by 8 gallons of wine and 4 gallons of spirits. There were surely a few hundred people in attendance because over 1,000 pounds of meat was prepared and 43 wine glasses lost. For now it appears that anything alcoholic was used in toasts at the Fourth of July and peace celebrations. What was in the glass was most like dictated by preference and budget. This diversity of drink follows my Independence Day experiences at Colonial Williamsburg. 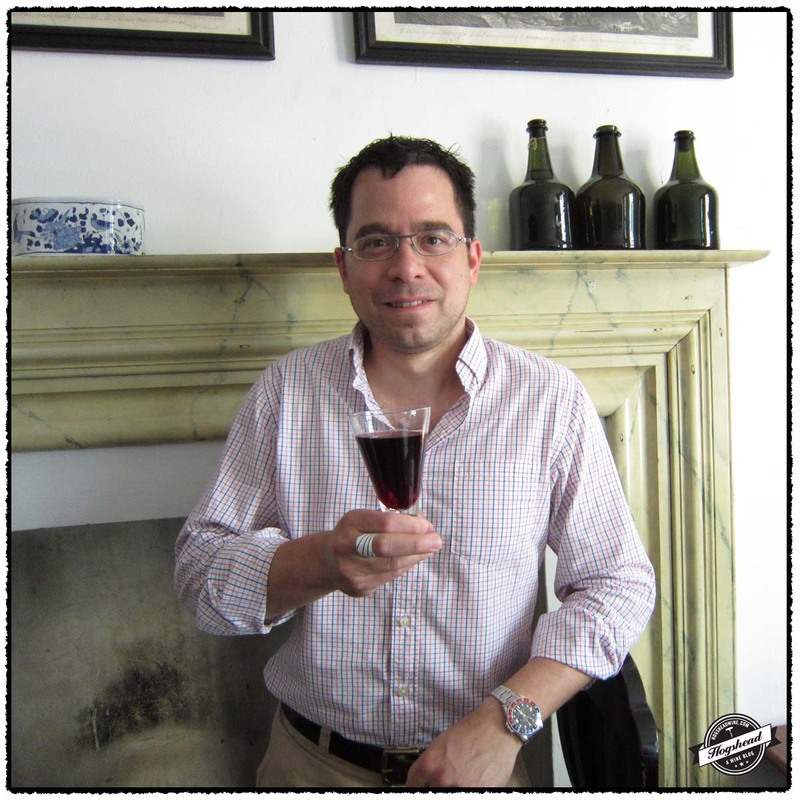 Here I drink the local beer at lunch, start dinner with Punch or a Rummer, then end the evening with wine. PHILADELPHIA, JULY 9. July 9, 1788. The Pennsylvania Gazette. Four Toasts for Independence Day and an American Wine to Fill Your Glass With Chapoutier, Chante Cigale, Coudoulet de Beaucastel, and More!